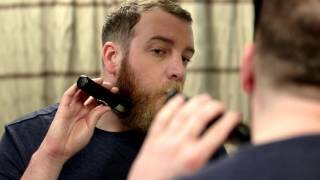 Use a #3 guide comb and cut the entire beard. Clean your lower neck by switching to a #1 and trimming from two inches below your jaw to your Adam’s apple. To fade it, switch to a #2 guide comb and trim the remaining area, blending the two previously cut areas. 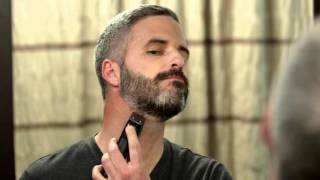 Use the trimmer with no guide comb or use the shaver attachment to trim below your Adam’s apple. Don’t forget to take care of any strays on the side of your neck.